Pennsylvania Coalition for Healthy Families and Workplaces (Paid Family Leave Paid Sick Days): Implementation Day is June 28! Join us in a Tweetstorm! Implementation Day is June 28! Join us in a Tweetstorm! Did you know that 14 of the 50 paid leave laws (paid sick and safe days and paid family and medical leave) passed in the US have anniversaries on July 1? And this July 1st Rhode Islanders start earning paid sick and safe days! 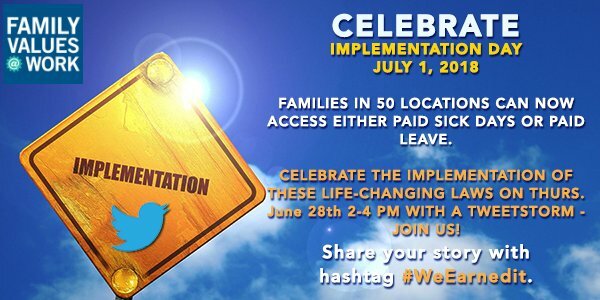 Join us in celebrating these anniversaries and the implementation of all paid leave laws in a tweetstorm on June 28 from 2-4 EST! Check out a few sample tweets below. In addition to the tweetstorm, Family Values @ Work and Main Street Alliance have been working together to hold events and place opeds across the country on June 28. We’ll keep you updated on what events are happening near you and where you can find opeds as they are published. #SmallBiz owners support the FAMILY Act and #PaidFamilyLeave to help us and our employees balance work and family without breaking the bank.